BATAM CITY - Hotel and Resort which has a reputation for providing comfort and experience with international standard facilities are like star hotels and resorts are looking classy by expatriates and business circles. Moreover the hotel under the auspices of the hotel management can guarantee the quality of comfort and facilities provided. berkeleas hotel is certainly going to make guests like kings and certainly did not disappoint. Harris Resort Batam is located at Waterfront City, which is the first property of the five properties owned by the Harris Hotels and Resorts in Indonesia, which is in the shade Tauzia International Hotel Management. 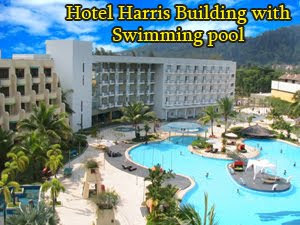 Harris Resort Batam itself had Establish since 7 years ago. With the concept of shaped resort accommodation, Harris Resort offers a variety of specially brought joy to the middle segment of tourists both domestic and foreign. Apparently Harris and resorts never lost the bright idea to issue a brilliant concept to its visitors. No other does not is not only aimed to satisfy the visitors Harris ressort. Moreover, in every moment, Harris Resort abstinence does not create a new concept. Christmas and New Year is momennya Harris Resort offers exciting new concept. Recently, Harris Hotels and Resorts launched a new concept that is more elegant and sweet is the "Simple-Unique-Trendy", with this concept Harris Hotels & Resorts provides and experience a new style appropriate for the middle class, especially the Asian community. "This is unutk Harris efforts focus more on providing facilities in the form of launching programs and concepts that can be accepted by society tourists" Said R. Diah Sadmawati as PR Manager of Harris Resort Batam. Diah added to this December, as usual, Harris Resort Batam will host a unique and exciting program that is expected to accommodate the tourists to enjoy Christmas this year with a series of events. "We have to draft a program titled 'Christmas Festifities' which will be held at 24 to 26 December 2009, ie a program celebrating the sanctity of Christmas to share with your loved ones" said Diah. Harris Resort Batam currently has a variety of outdoor activities facilities that can be used as water exercises consisting of Pool; Jacuzzi, Jetski; Banana Boat; Parasailing, a series of outdoor activities such as Table Tennis; Gokart; Volleyball / Beach volleyball; Air Soft Gun; Flying fox; Cycling; pedaling Becak, also indoor activities such as Spa; Reflexology; Fitness; Squash; Bowling; Billiard. While the food choices of Food and Beverage sector is also presented that vary include Harris Café typical dish served various Indonesia, Asia and Europe, Pronto Pizzeria located in the famous pool side with a specialty of Baked Pizza Wooden its very crispy, Harris Grill located on the beach side serving various European specialty. D Bar is a relaxing place for guests to enjoy drinks and snacks while listening to music or enjoy the TV programs through the wide screen. "All that is presented by Harris Resort Batam, just for more comfort and sensation of enjoying a holiday in the resort classy like Harris" Said the chat ending Diah.